The 2018 Volkswagen Atlas is VW’s latest effort at building a large SUV/CUV. I might actually argue that the 2018 VW Atlas is its first real effort at appeasing the large SUV/CUV market in North America. The previous effort was the VW Touareg, a fantastic vehicle that shared its platform with no less than the Porsche Cayenne and Audi Q7. The Touareg, while only offered as a 5 passenger vehicle, is priced as a premium import vehicle and some models actually topped out at over $100,000. Per Volkswagen’s website, vw.ca, the 208 VW Touareg starts at $51,960, there is no 4 cylinder TFSI engine offered and the standard six-cylinder engine offered is the more powerful VR6 model . A comparable Touareg is anywhere from $10,000 to $15,000 more expensive than a V6 powered VW Atlas, which starts at a shade under $40,000. 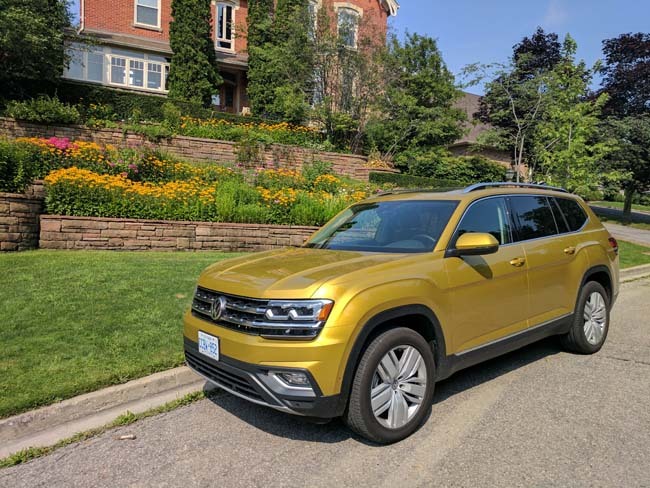 The Volkswagen Atlas was designed in the US and built in Tennessee to compete in North America, even though it will also be manufactured and sold domestically in China (as the VW Teramont). The approach is similar to what Volkswagen did with the Jetta and Passat. Appeal to the masses and remove all the costly bits that price sensitive buyers aren’t going to notice. In essence, play the game other automakers have been working at for years. The Volkswagen Atlas is a large vehicle. Our Execuline model with a large panoramic glass sunroof, heated and cooled seats, large colour LCD screen including Nav system and a host of connectivity systems, probably weighs the better part of 4500 pounds. Versus the Touareg, the Atlas has 5 extra inches over its wheelbase, bumper to bumper its 11 inches longer, 2 inches wider and about 1.5 inches taller. The additional room translates into enough room for 7 passengers to sit comfortably in the 3 rows of seating. 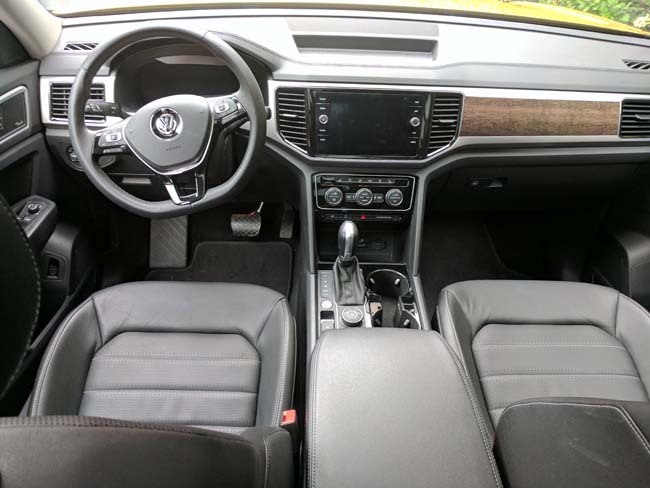 The large front leather seats are comfortable and can be adjusted for lumbar support and firmness. Seating in both aft rows are supportive and range from really comfortable in the middle row (except for the middle passenger who deals with the centre console from the front) to decent in the third row. At a shade over six feet tall I had no issues getting into or fitting in the third row. Volkswagen has enabled the middle row seating to fold and slide forward providing a gaping path to step up into the rear seats. The middle seats also slide on rails to adjust legroom requirements in the cabin. The third row seating area sports air vents and pillar mounted speakers to accommodate occupants. The Atlas’ extended length also allows for reasonable storage behind the third row of seating. We measured a floor space of 24 inches deep and as the rear hatch is relatively upright, the gap at the top of the seats was still 12 inches in the corners. The side panels have been scalloped to permit longer items laid out across the floor in back of the rear seat. 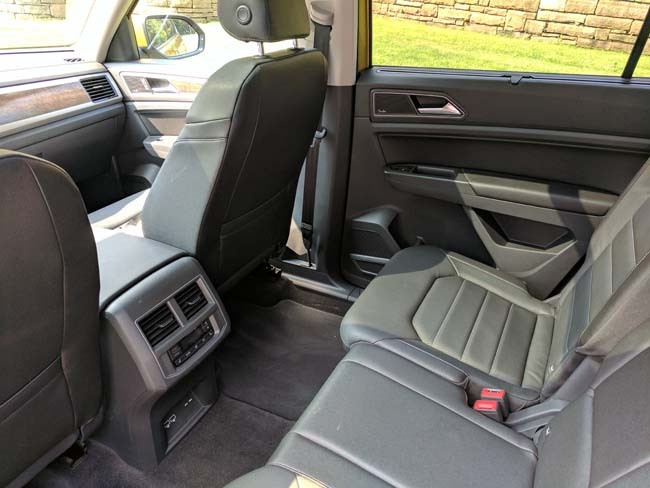 Anyone looking for a vehicle to transport up to seven passengers will appreciate the multitude of cup holders and storage bins through out the cabin. Sitting behind the wheel, drivers have a commanding view of the road. Large windows and upright architecture, provide excellent visibility. Switch-gear is traditional Volkswagen, understated and efficient design. The tester we had was equipped with the Volkswagen digital cockpit with a customizable instrument cluster and a large LCD infotainment/Nav screen counted in the centre of the dashboard. Many of the functions on the infotainment screen can be manipulated from the multi-function steering wheel. This is a good thing as the touch screen LCD panel with small knobs to adjust volume and tuning, is a chore to use when driving. On the road the VW Atlas is not one would typically expect from a Volkswagen. Volkswagen had been synonymous with a traditional European ride. The first thing you notice is that the ride on the Atlas is more cushioned, almost floating. There are no active magnetic suspension dampers, so you feel potholes on the road. The steering is relatively vague in terms of feedback, yet is responsive to input and overall. When put to the test, the Atlas handles crisply. While some of my comments may sound as a knock against the Atlas, it isn’t. Volkswagen has steered the brand back to its roots as its name suggests, the people’s car. Consumers in North America have been buying large SUV’s and have a different mindset in what matters when it comes to the requirements in these vehicles. 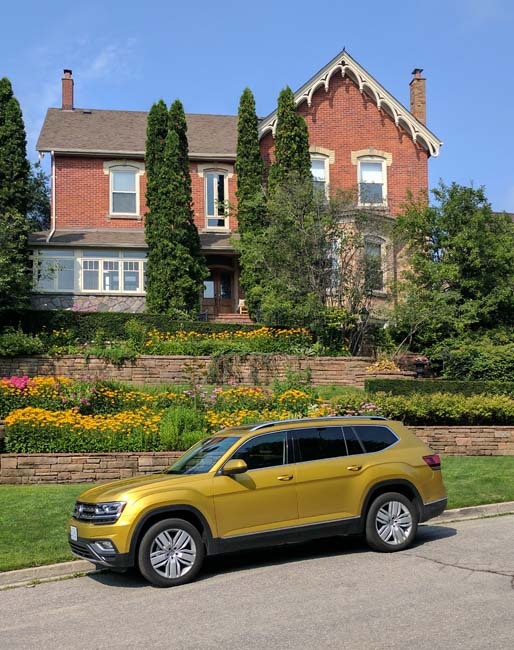 The 2018 Volkswagen Atlas checks the boxes on the items that matter most to North American buyers. Its large, its comfortable, has interior room, can tow most recreational vehicles and represents pretty good value in the market. To sweeten the pot, Volkswagen has also thrown in a six year 72,000 mile bumper to bumper warranty for buyers in the USA. Another distinction in US warranty offerings is that this warranty is transferable, other warranties that bested Canadian offerings were always explained by pointing out that the warranties were not transferable. In Canada, the warranty for all VW products remains at four-years or 80,000-km.